What is now known as Donald W. Reynolds Razorback Stadium first opened in September 24, 1938 as University Stadium. A few days later it was renamed to Bailey Stadium in honor of Arkansas’ then current governor, Carl Bailey. He had just been renominated to a second two year term and was expected to easily glide to a victory in November over a nominal GOP opponent, which he did. Two years later, Homer Adkins, a former Little Rock alderman who had been aligned with Bailey foe Joe T. Robinson, challenged Bailey as the latter sought a third term. Bailey and Adkins had long been opponents, but had never faced off personally. In the August 1940 primary, Adkins bested Bailey. The animosity between Bailey and Adkins apparently stemmed from the time that Bailey, as prosecuting attorney, filed charges against a friend of Sen. Robinson. Though the friend was eventually pardoned, Robinson and his political circle did not forgive Bailey. The fact that Bailey backed Brooks Hays, who opposed Robinson, did not help matters. By the mid 1930s, Arkansas Democrats were clustered around either Bailey or Adkins. Adkins had served on the Little Rock City Council from April 1930 until April 1934. He previously had been Sheriff of Pulaski County. At the suggestion of Sen. Robinson, President Roosevelt had appointed Adkins as collector of internal revenue. 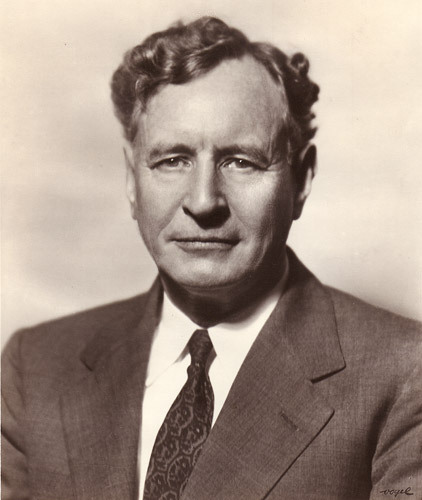 Given all of the federal programs that took place in Arkansas throughout the 1930s, Adkins was well positioned to strengthen his political network. He stepped down from the job when he challenged Bailey in 1940. Obviously, by 1941 the new governor was none too pleased that the football stadium of the state’s flagship university bore the name of his vanquished foe. By the time the 1941 football season came around, the stadium was known as Razorback Stadium. It held that name from 1941 until the September 8, 2001, rechristening with its current name. And what of Adkins and Bailey? The two longtime foes united to back Sid McMath in his gubernatorial efforts. But the reconciliation was only for political purposes. However, both lie buried in Roselawn Cemetery in Little Rock. On September 14, 1957, in an attempt to end the stalemate in Arkansas, President Dwight D. Eisenhower met with Arkansas Governor Orval Faubus. The meeting was brokered by Rep. Brooks Hays, whose district included Little Rock. The meeting took place in Newport, Rhode Island, where the President was vacationing. After exchanging pleasantries, the President and Governor adjourned to the Presidents office where they met privately for about twenty minutes. During that conversation, Faubus proclaimed to the President that he was a law abiding citizen and discussed his own World War II service. President Eisenhower suggested to Faubus that as a law abiding citizen, he should change the National Guard’s orders so that they protected the Little Rock Nine, not kept them from the building. He reminded Faubus that the Justice Department was prepared to issue a injunction against him and that the governor would undoubtedly lose in court. Following their conversation, Congressman Hays and U.S. Attorney General Herbert Brownell Jr. joined the two in a larger office and continued conversations for approximately another 100 minutes. When the meeting was over, the President felt like Faubus had agreed to refocus the mission of the National Guard and allow the Little Rock Nine to enter. The President’s statement to the press thanked Faubus for his cooperation. Upon returning to Little Rock, Faubus issued his own statement which did not address the President’s statement directly. He did not even mention the National Guard or the students. Apparently, President Eisenhower felt betrayed by the Governor’s actions. The stage was set for these two to continue their face off.